We want you to feel at home when you’re here. Remember to make yourself at home: get a blanket, find a comfy chair, bring ear plugs or an eye pillow — whatever you need to completely relax. Your healing experience is enhanced when you take care of yourself and your needs! Let us know if there is anything we can do to make your experience more enjoyable! In order to insure a specific time please book appointments in advance by phoning, emailing, or booking online. 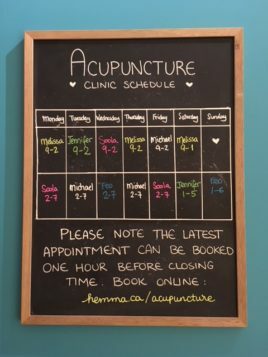 Hours listed indicate range of available appointment times. Please remember to give us at least 24 hours notice if you need to change or cancel. There is a $15 fee for missed appointments. When planning your arrival give yourself enough time to pay, schedule your next appointment, get tea. Remember that treatment times can vary. When you have to leave at a specific time be sure to let us know. Please remember your belongings. There are hooks in the hall for your coats, and a basket next to each chair for your things. Hemma is not and cannot be responsible for left, lost or neglected items! Hemma donates all Lost & Found items to Our Place at the end of each month. Try to avoid coming in on empty. If possible enjoy some food within a few hours of your appointment time. Scents! Please refrain from using perfumes, or smoking just prior to your appointment time. Cell phones are amazing – as amazing as they are, please remember to turn them off before coming to Hemma. We would prefer to speak with you in person. Thanks.